Did the Giant from Jack the Giant Slayer steal his look from Andre the Giant? 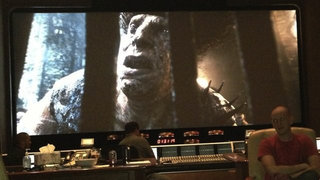 The first ever image of one of the giants from Bryan Singer's Jack the Giant Slayer looks a lot like our favorite character from The Princess Bride, played by the one and only Andre the Giant. Look at the top picture, and then look at this picture. Am I right, or am I right? Released via Singer's twitter account the images show an editing bay visit. According to the tweet they are prepping a trailer for Guardians of the Galaxy and The Hobbit. I bet everyone is angling to get in front of The Hobbit these days. Take a look at the original images, and let us know — is that Andre?